So I have this xt250 which I'm doing a bit of research on. The exhaust pipe has three fixing points for the muffler cover. 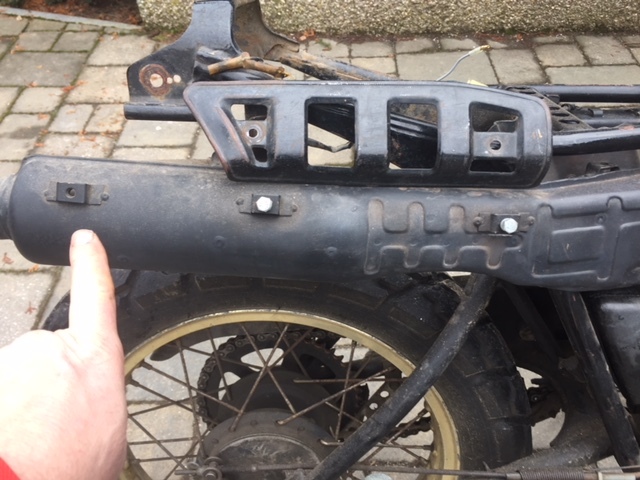 However the muffler cover I have which seems correct from all the graphics from the web and also from fowlers website, only covers TWO fixings. So my question is, can anyone tell me which bike the three fixing exhaust might be from? That way I can either buy a muffler for this exhaust or try to source an xt250 exhaust. Also, the bike seems to lean over A LOT on the side stand. Can anyone give me an exact length of stand, I'm wondering if it's not the correct one? Tried to mail him, but computer says "he not receiving messages"
Current Bike(s):yamaha XT500E XT500C XT500G XT500 Dakar replica TT500D TT500E TT500EIT250D TT600 TT600R XT600 43F XT600 1VJ DT360A DT1E Triumph T140V Triumph TR5T TY50P TL125. God it's been so long and I have to admit I have had a big life change over the last 6 month due to a house move and renovation. 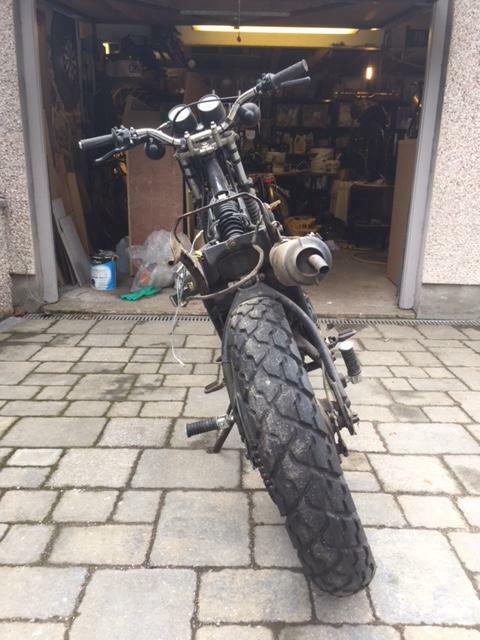 Xt250 I'm ok with but only just by memory as I have only restored my lads xt 250 which he has sold on but I can but try and help . Do you have any pictures of the exhaust. Hi TommyTB, you have a long list of my fav bikes there. Anyway so I had this brand new xt250 years ago that some guy tried to "do" me on, when it was three weeks old. So just got another one from same era. So this bike I think has been worked on by Victor and Igor! Bits look strange. Odd, scrambled from various sources. I've got manuals and microfiche and stuff. So this exhaust has three fixing points, yet the muffler only covers two. I'm wondering if I have the wrong exhaust???.? Have you any idea where I might source a three fixing muffler? my other point is the bike seems to lean over quite far? Any comment. Yup, the muffler you have may not be exactly XT250 spec but the bolt holes you pointing at are for a heat shield. The muffler itself is only held in place with the lug on the frame under the seat. Yeah, sorry, I should have said muffler protector. But that doesn't answer my question. Why have I got three fixings, is this exhaust from another bike? One of my original questions were, which bike is the exhaust from? Can anyone tell me? My other question was and still is, what about the lean of the bike, it appears excessive, any comments. The bike you show doesn't "appear" to lean over as far. So can anyone tell me the length of the stand, in case Igor also fitted a different stand?! That lean doesn't look that excessive to me, my old Dragstar and my current ST1300 all lean at similar angles. Simple checks are is the stand bent at all, and check where it bolts onto the frame. Thanks for that, Bit i want to keep bike original so was hoping there was an xt250 owner out there who could just measure it. And another maybe 350 owner who might recognise the "strange" exhaust. Maybe the exhaust is off another bike but it looks ok on yours to me, the guard you have will be good enough wont it...aren't you happy with it? I received this reply from Fowlers Yamaha UK, just thought I'd share it. Might jog someone's memory, and tell me which market it was built for perhaps. As for the lean, a friend suggested I might have different suspension, maybe? Hi Brian, Well, the 3Y3 tells us that it is the correct exhaust for the XT250. The bad news is that none of the parts catalogues we have checked that use the 3Y3 exhaust use that 3 bolt heatshield, despite the 3 fixings. They all use the 2 bolt type that you already have, which obviously means you are left with a surplus fitting point.The reason for this could well be that the exhaust part numbers have superseded over the years to the same number, which is 3Y31471161. The original part number could have been one that just had the 2 bolt fixing, but, at some point, rather than continue to produce 2 exhausts that are essentially the same with the exception of the number of fixings, they changed the number over to the 3 bolt one. Sorry Brian but I am not sure what else to suggest. We've checked all the catalogues we can think of, and tried searching for a possible part number using the part coding system, with no luck. It is possible that the 3 bolt shield was only used for a couple of specific markets when the bike was new, which may explain why it is not shown anywhere except on the MotoProfi pages. Nowhere near long enough for the xt, still looking for stand options for the daughters bloody Aprilia, still leaning against walls and using the paddock stand till we use it more when it warms a bit. Now tried a couple of aftermarket units that either bend or are too short. Worst comes to worst I'll cut stand and weld a bit in. It's either the wrong stand or Victor F and Igor have changed wheels( they look original) or the shocks are changed and its taller. I'd just love it to know someone with an original xt250 then all my dumb questions could be answered. Stand not bent, very little play in the bolt bracket. There is no sign of stress at the bracket suggesting that it's not bent. The stand doesn't stick out when raised to horizontal. I really don't want to surmise what's wrong, was simply hoping for a couple of metric sizes odd picture.